Who doesn’t love chocolate brownies with a hot cup of coffee? Well, how about chocolate-coffee brownies with your coffee? Double delicious, right? 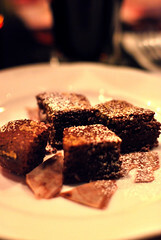 The chocolate coffee brownies come with a serious warning – one is not enough! They will indeed go like hotcakes so however many you think you might need for your guests, make extra. As with all great food, the quality of the ingredients will determine the quality of your dish. Coffee recipes are no different so be sure to select a premium coffee for best results. To that end, Lavazza, the beloved Italian benchmark for great coffee, is a superb choice. 1 TBSP Very dark, black coffee, cooled. 1). Sift together flour, baking powder, cocoa, and salt. 2). Cream together butter, sugar, eggs and coffee until smooth. 3). Gradually mix in flour mixture. 4). Divide dough into two halves, wrap each in plastic wrap, and chill for an hour. 5). Preheat your oven to 375ºF. 6). Take dough out of refrigerator and allow to warm lightly by squeezing it in your hands before unwrapping. 7). Roll out to about 1/4 inch thick using a well-floured surface and rolling pin. 8). Cut cookies into desired shapes. 9). Place on un-greased cookie sheets, about 1 inch apart. 10). Bake for 7-8 minutes. 11). Cookies will set as they cool. Allow them to rest for 5 minutes before removing from cookie sheets.